A68-113 served as a target tow aircraft with 10 Squadron based at Garbutt air field in Townsville. It was a silver aircraft with a red nose spinner, and a yellow band around the fuselage. There were gloss black bands diagonally under the wings. The Squadron badge was displayed on both sides of the fuselage. It was a typical Melbourne winter weekend. Wet, windy, and miserable. There was nothing on the TV except interminable Aussie Rules football, so I decided to hibernate to the study and attack the shelves with a feather duster. That done, I rearranged some photo albums, and bent down to pick up a faded photo which had fallen on to the carpet. 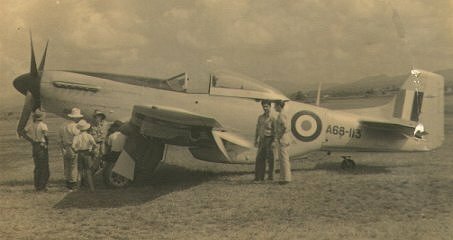 The photo showed a silver Mustang with RAAF roundels, a blue spinner, and a yellow band around the aft fuselage. I recognised it as my old friend A68- 113. In the background was Townsville. My log book revealed that I was the pilot on that day, and that the photograph was taken from a Wirraway. Mustang A68-113 was based at Townsville in 1953 and shared the tarmac with several Lincolns, a Dakota and a Wirraway. While we used the aircraft for fighter affiliation (mock combat) with the Lincolns, its main purpose was as a target towing aircraft to give Lincoln air gunners live firing practice at a drogue. Perhaps because it only flew a few hours each month, 113 seemed to spend most of the time with its cowls on the hangar floor and a maintenance sheet full of irritating snags such as hydraulic and glycol coolant leaks. In those halcyon days, I enjoyed many hours helping the ground staff work on the Lincolns, and in return they would go to great lengths to ensure the Mustang was serviceable for me to fly. After take off, I would climb to 15,000 ft and pull tight around the edges of towering white tropical cumulus, then from a wingover pull up at 350 knots into a loop or a vertical roll. Any unsuspecting Lincoln would be bounced, and we would engage in mock battle. With only a few hundred hours in my log book, I was no match for the experienced war time Lancaster pilots that were amongst our bomber crews. But for a 21 year old, flying old 113 was an exhilarating experience. The Lincoln was a heavy bomber powered by 4 Rolls Royce Merlin liquid cooled engines. It was armed with twin 0.5 inch calibre machine guns in the nose and tail turrets, and a pair of 20mm cannon in the mid upper turret on top of the fuselage. It was essentially a larger version of the wartime Avro Lancaster, with a fully loaded weight of 37,000 kgs and a crew of seven. The Lincoln was designed to be flown by one pilot, although it was customary to carry another crew member to sit in the copilot seat. For air gunnery practice, the Mustang would tow a target drogue attached to a 100 metre cable. A stanchion attached near the right wing tip ensured that the cable was well clear of the tail surfaces. After the rendezvous over the gunnery range of Rattlesnake Island 10 miles from the Townsville coastline, the Lincoln and Mustang would fly in open formation 500 yards apart. The Mustang would then accelerate and the Lincoln gunners would open fire at the moving drogue. I was scheduled to fly the Mustang on a gunnery exercise, and on the evening before, the Lincoln mid upper gunner approached me over a beer in the Sergeant's Mess. During the War, he had been an air gunner on Halifax bombers over Europe. It was to be his last trip before retiring from the RAAF and he was keen to break the squadron record for hits on the target drogue. The gunner explained that it would make his task easier if I could position the target drogue close to the muzzles of his twin cannons. By this he meant a formation spacing of 100 yards instead of the usual 500 yards. Now Blind Freddy couldn't miss the target at that close range, but a few free beers convinced me that I could indeed help out an old airman achieve his ambition. Before the armourers loaded the guns, the cannon shells and machine gun bullets were tipped with coloured paint which would show up on the drogue as they passed through. Each gunner knew the colour of his ammunition which meant that all could blaze away at the target at the same time. After all the ammunition was used up, the Mustang would return to Townsville and jettison the drogue on the runway. The bullet holes and their colour would be checked and scores allotted to each gunner. The following morning I donned my parachute and mae west (life jacket) and strapped into 113. The Lincoln was just airborne as I lined up for take off on runway 02. The ground crew attached the cable and yellow drogue to the wing tip stanchion, and I taxied slowly forward until the cable was taut. Then it was merely a matter of 58 inches of manifold pressure and 3000 revs to get airborne. Climbing at 150 knots, the Mustang needed considerable left rudder trim to offset the drag from the fluttering drogue. The Lincoln, meanwhile, was circling over the gunnery range at 5000 ft while waiting for me to get into position. After making radio contact, I asked the Lincoln pilot to fly level while I came around fast and to his starboard side. The Lincoln gunners reported guns armed, and turrets were swivelled to track the drogue behind me. The Lincoln was cruising at 160 knots as I caught up and dropped partial flap to slow up from 230 knots. The Mustang was very sensitive in yaw to power changes and with the heavy pull of the drogue and cable on the right wing, plus throttle jockeying to maintain formation, I was forced to continually adjust the rudder trim which was already full scale left. I slid the Mustang close (as agreed over beers) until I could clearly see the faces of the rear and top gunners looking at me over the barrels of their guns. The top gunner with the two 20mm cannons gave me a sly thumbs up, and with gloved hand motioned me to come closer. I shook my head indicating that 100 yards range was already stretching the friendship! Now the time had come to draw ahead until the drogue was abeam of the Lincoln. All I had to do was position 100 yards ahead and fly straight and level while looking over my left shoulder to keep the bomber in sight. This was relatively easy when at 500 yards range, but was literally a pain in the neck now. The Lincoln pilot ordered firing to commence and all guns opened up. One minute later firing ceased and I was ordered to return to base to drop the drogue on the runway. I had just pulled up and away from the Lincoln when the pilot relayed a request from the mid upper gunner for one more pass. One of his guns had jammed and after clearing the stoppage he had a few more rounds remaining. This was to be his last shot at the record before he ran out of ammunition. This was no problem, and I swung around behind the Lincoln to repeat the exercise. The Lincoln pilot was in on the plot, and allowed me to sneak in closer than usual. This would ensure that the old gunner would get certain hits, which if the record was broken would surely bring its own reward of free grog in the Sergeant's Mess that night. I drew ahead and gently edged the Mustang into 50 yards range. The Lincoln now formated on my aircraft, as I was unable to get a clear view of the bomber behind my left shoulder. The yellow drogue was already riddled with holes, and bullet damaged pieces of fabric snapped in the slipstream. I had just made one last adjustment to the rudder trim when the Lincoln pilot ordered the gunner to open fire. The noise of the Mustang's Rolls Royce engine drowned out the heavy banging of the twin cannons, but a second later I had the fright of my life when the Mustang skidded full scale left into half a barrel roll. Instinctively I hauled back on the stick to get well above the Lincoln, and squawked over the radio that some idiot had shot away my rudder. However I soon regained control and ensuring my aircraft was now well clear of the Lincoln, I gingerly wound off yards of rudder trim until the Mustang was in balanced flight. A glance at the starboard wing showed 100 yards of whipping steel cable, but no drogue. The wire was a real danger, so I quickly jettisoned it into the sea. Behind me, the Lincoln crew had seen the drogue shot away, and nearly wet themselves with laughter at the sight of the Mustang corkscrewing around the sky. The mid upper gunner however, was most unhappy at the loss of the drogue and with it any proof of the accuracy of his shots. From point blank range, the cannon shells had literally blasted the drogue to pieces. One shell had cleanly severed the towing cable, releasing the drogue to flutter into the sea. With full rudder trim applied and my feet resting only lightly on the pedals, the lack of compensating drag from the missing drogue had caused the Mustang to take up an uncontrolled hard skid. This converted swiftly into roll towards the Lincoln before I could correct it. That night, the now retired gunner was unmercifully ragged by his colleagues in the Sergeants Mess. There was no doubt that he had scored many hits with his shells, but he would never be able to prove it. I was carpeted by the Commanding Officer for allowing myself to be conned into flying too close to the Lincoln for safety. I didn't have a leg to stand on, and was put on Orderly Sergeant Duties for a week as punishment for my lack of airmanship. Finally, as the drogue was the only one remaining in the store, and was now probably a meal for the sharks, there was no more air gunnery for our Lincoln crews. A few months later someone in Air Force Headquarters made a command decision to remove all guns from our Lincolns. The mid upper turrets were removed, and an escape hatch fitted in their place. Orders came through to return old 113 to storage somewhere in NSW. Our ground staff were sad to see the Mustang go, as they always enjoyed the fast low level beat ups which was a familiar end to each sortie. The Commanding Officer did his best to convince Headquarters that for the prestige of the RAAF in North Queensland, the aircraft should remain with the squadron. He had flown Spitfires during the war, and enjoyed nothing more than to get out of the office, throw on a parachute and for an hour or so, throw 113 all over the blue Townsville skies. The decision by Top Brass was final, and a date set for the departure of the Mustang. The Commanding Officer rostered himself for a final fling, and I did two more flights. The first was an aerobatic and dog fight display as part of the Battle for Britain Week. This required me to stage a mock fight with a Lincoln in front several thousand spectators at Townsville. The Lincoln was flown by an experienced wartime pilot who not only evaded my attacks, but succeeded in getting on my tail. He cheated by throttling back both engines on one side as he ripped into a steep turn. I tried to follow him, but he was too good for me. In fact we both got so involved in the scrap that we failed to notice that we had strayed away from the aerodrome and the gaping spectators. The RAAF Air Traffic Controller called us by radio, and rather acidly suggested that the display was supposed to be over the crowd, not 3 miles away! A few days later, all aircrew of the squadron were scheduled for an escape and evasion exercise. Everyone was to be trucked to the nearby mountains to spend 3 days in the bush. Army patrols were to try and catch us. The thought of living rough amongst snakes and green ants terrified me, so I decided to convince the Commanding Officer that someone should stay behind in case there was any emergency search and rescue flights. Naturally that someone should be me! To my delight he fell for it, and I received black looks from the rest of the troops as I waved them goodbye from the safety of the Sergeants Mess. On the next day I suggested to the CO that it would be good for the morale of the hunted aircrew if I flew 113 and located the Army patrols who were chasing them. I would then make dummy strafing attacks on the soldiers. Hopefully the RAAF escapees would see the Mustang and head away fast in the opposite direction away from their pursuers. The CO fell for that one too, and that afternoon saw me circling over several groups of men in dark greens and bush hats that I spotted crouched under trees. They appeared to be brewing up a meal judging from wisps of smoke drifting above the foliage. Several were carrying rifles, which proved that they were Army. I searched carefully, but could not see any aircrew in the vicinity. This indicated that either they were not in the immediate area, or they were well concealed. Two days later, a weary bunch of pilots, navigators, signallers and gunners climbed down from trucks driven by the Army. My cheery greeting to them was met by cold stares, and a good many two fingered gestures. The exercise had been a disaster, with most of the aircrew captured by the army patrols within an hour of my departure from the scene in the Mustang. I then realized that from the air, the RAAF aircrew who had been dressed in dark green flying suits and army type bush hats, looked like soldiers who wore similar attire. The people that I had spotted in the bush were not the Army, but my squadron colleagues. By diving on them, I had unwittingly exposed them to the attention of a well concealed Army patrol. The rifles that the RAAF were carrying were actually walking sticks cut from the scrub! And so for the second time in as many weeks, I was relegated by the Commanding Officer to Orderly Sergeant duties! A few days later 113 departed southbound from Townsville, and I lost touch with its whereabouts. My tour of duty at Townsville was completed, and I was posted to the RAAF Central Flying School at East Sale to do a flying instructor's course. Other Mustangs were being sold into civilian hands, and I often wondered about the fate of that beautiful silver aircraft in which I had enjoyed so many happy, if sometimes embarrassing times. After completing a two year tour as a qualified flying instructor at Uranquinty in NSW, I was posted back to Townsville to again fly Lincolns. The loss of their guns and turrets had emasculated them, and instead they carried homing torpedoes with which to frighten submarines. I missed old 113, and the Wirraway was a miserable substitute. A few summers later, I was posted to Melbourne on a desk job as the RAAF Aero Club Liaison Officer. There were two civilian registered Mustangs at Moorabbin, but I didn't have the necessary connections to get my hands on them. On the 12th April 1962, the day was cold and miserable with low cloud hiding the Dandenong Ranges. At Moorabbin, the pilot of one of the Mustangs posed for photographs before starting up. The aircraft was painted gaudily in red and black, with silver external fuel tanks under the wings. It had a British registration G-ARUK and the pilot was a British racing car driver who was flying to Bankstown. Using the Mustang, he intended to break the Australia to England speed record for a single engine aircraft. He was not an experienced IFR pilot and most of his flying was on light aircraft. Fifteen minutes after the Mustang had departed, I heard a news flash on the local radio station that an aircraft had crashed at Kallista in the Dandenong Ranges. I lived nearby, and drove towards the area, passing an ambulance, which was coming from the accident scene. Rounding a curve in low mist and drizzly rain, I came across the still smouldering wreckage of a red and black painted aeroplane. I had seen enough aircraft crashes during the war to know that this one had gone in at high speed. The tail was scorched, but recognizable as belonging to a Mustang. I felt an overwhelming sadness at the death of a pilot and this once beautiful machine. Now 24 years later, the Melbourne weather was still wet and miserable, and in my study I picked up the faded photo of old 113 and decided to write this story. Each tale has an ending, and I contacted a friend of mine who was an aviation historian. I told him of the fun I used to have in a RAAF Mustang numbered A68-113, and did he happen know where this aircraft was now? He never came out the other side. NOTE: according to the book "Mustangs of the RAAF and the RNZAF" by Peter N. Anderson, the mustang bought by British racing car driver Ron Flockhart was A68-173 (not A68-113). It states that Flockhart was killed in it at Kallista, Victoria in the Dandenong Ranges on 12 April 1962. His mustang initially was registered as VH-JWB but it was later changed to VH-UWB. UPDATE: John Laming has further evidence to suggest that it was "Old 113"